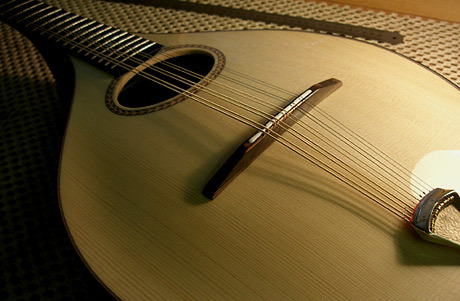 If you are thinking of having a pickup fitted on your mandolin, cittern, mandola or bouzouki, this page will give you an idea of the modifications that will be made to your instrument, when an under-saddle type pickup is installed. The piezo under-saddle transducer is probably the most popular method of amplifying an acoustic instrument. Here I am fitting the Headway HE4/FEQ system on a Shippey cittern. 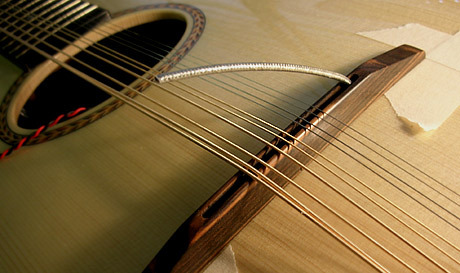 The method is very similar for the LR Baggs “Element” and other under-saddle pickups with endpin preamps when installed in instruments with a similar bridge design. The piezo cable (at the bottom of the photo) sits in the bridge saddle slot under the saddle. The cable is 2.3mm in diameter, with an active length of 98mm. The preamp with onboard fixed EQ modifies the signal from the piezo to produce a more natural tone at a suitable impedance. 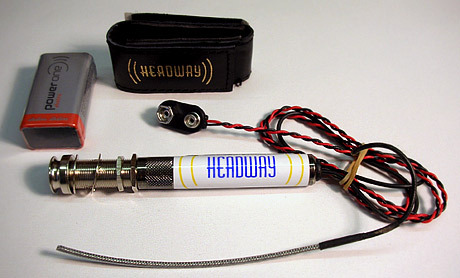 The preamp components are inside the metal sleeve labelled ‘Headway’. The endpin jack accepts a 1/4″ jack plug. Inserting the jack plug switches the battery on. The socket also incorporates a strap button. A 9 volt PP3 Alkaline battery powers the preamp. 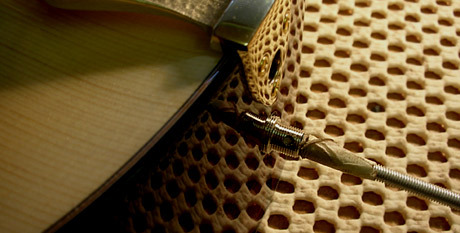 The battery is held in a pouch which is velcro mounted inside the instrument and is accessible through the soundhole. First I make sure that the bridge is in the correct position and that the instrument plays perfectly in tune. 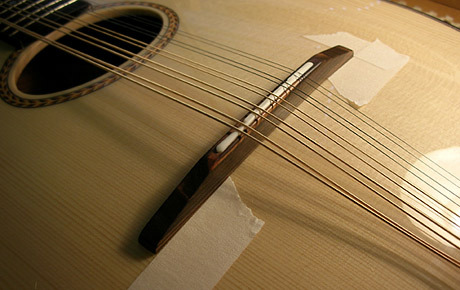 I use masking tape to mark the bridge location before slackening the strings. With the bridge removed, I’m drilling a 3mm hole at the treble end of the saddle slot for the piezo cable to pass out through the bottom of the bridge. The drill is angled so that the pickup doesn’t have to bend through too sharp an angle. The shielding around the piezo cable can be damaged if it isn’t handled carefully. Next a hole is drilled through the soundboard. I position the bridge (with the saddle removed) and tension the strings sufficiently the hold the bridge firmly in place whilst drilling. 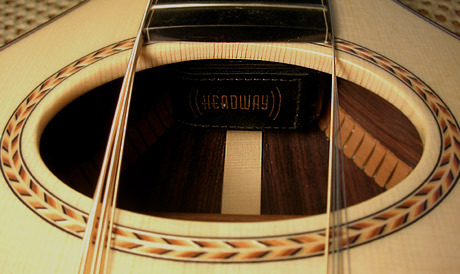 I pass a length of string or wire through the hole in the soundboard and out through the soundhole. Then the string is fastened to the end of the pickup cable with tape, so that I can pull the pickup into place. The battery holder is attached to the top block with velcro, allowing relatively easy removal for battery changing. The piezo cable is passed through the bridge. 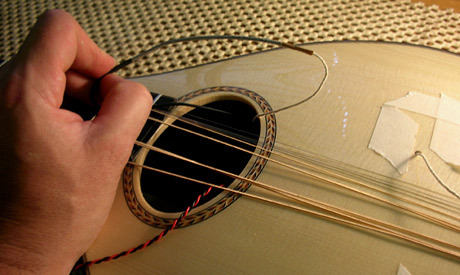 The cable type of pickup senses vibrations from all directions, so in addition to string vibration, it can also pick-up vibrations from the soundboard via the bridge. This helps achieve a more ‘natural’ amplified sound with some of the particular instrument’s character preserved. Here I’m using a metal rod pushed into the jack socket to guide the endpin jack into place. The endpin jack needs a 12.5mm (1/2″) diameter hole in the endblock. I use a Forstner bit for this because it cuts a clean hole and is easy to control. 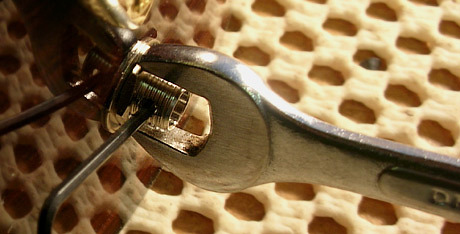 The nut is tightened on the endpin jack. 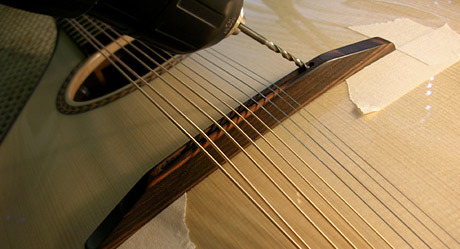 The Allen key is used to stop it from rotating and twisting the wires inside the instrument. 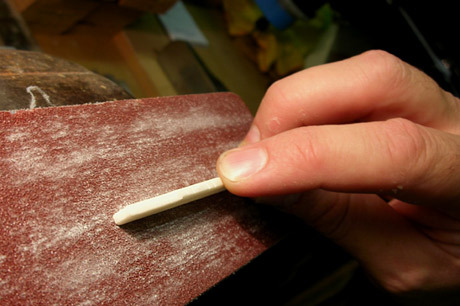 The bone saddle needs to be reduced in height by 2.3mm to take account of the pickup and maintain the same action. 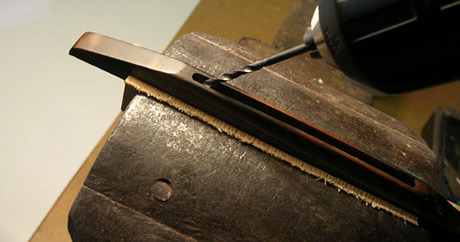 Abrasive glued to a flat block helps to keep the bottom of the saddle flat and square. In order for the pickup to function properly, it is critical that the bottom of the saddle and the saddle slot in the bridge, are absolutely flat and that the saddle slides freely (but is not loose) in the slot. The wiring and preamp are hidden inside the instrument. The only visible clues are the battery pack (visible through the soundhole) and the endpin jack. The advantages of the undersaddle pickup are its simplicity, reliability, quality of sound and high resistance to feedback.